“The British are Coming!” Paul Revere exclaimed to the sleepy people of Boston in the dead of the 1775 night, warning them of imminent arrival of some nasty British soldiers hankering for a few arrests. Ignoring the dubious historical accuracy of the whole incident it’s a certain that the phrase has gone down as one America’s finest in its relatively short history, although the threat of musket wielding redcoats has passed the British are coming again in the form of a cinematic New Wave …or so the media English say. Hailed as a prime example of the tremendous year British film is enjoying, The Selfish Giant has entered the public domain to a modest release contrasted with critical acclaim. The last British New Wave was over 50 years ago featuring the gritty kitchen-sink dramas of A Taste of Honey and The L-Shaped Room along with the controversial, yet brilliant, If…begging the question, is 2013 the year Britain makes its triumphant return. Loosely, very very loosely, based on flamboyant fop Oscar Wilde’s short story of the same name, The Selfish Giant has been uprooted to the unfamiliar setting of a desolate Bradford estate. Amongst the poverty stricken inhabitants are 12 year old best mates Arbor (Conner Chapman) and Swifty (Shaun Thomas). Arbor is plagued by ADHD that leaves him temperamental, unable to cope with the rigidity of school, while his home life offers little better due to his “smack head” brother’s presence. Swifty is similarly constrained by his family life, his gypsy roots the focus of much ridicule from his peers on top of his families’ financial problems. The likely duo, Arbor the tough yet caring livewire matched cleverly by the sedate and sensible Swifty, are “excluded” from school following a ruckus leaving them at a loose end, rejected by school and family the kids turn to local scrap year owner Kitten (Sean Gilder) for work. As Arbor hones is resourceful nature on obtaining scrap metals, often through illegal means, Swifty becomes infatuated with Kitten’s horse Diesel after being entrusted with caring for, and racing it. Is this new employment a viable way out of their squalor or does Kitten have a personal agenda to which he uses the naïve boys to exploit handsomely? The Selfish Giants’ most striking element is its wonderfully paradoxical scenery, the misty Yorkshire countryside is marred by the emergence of two daunting factory chimneys barely visible through thick haze, while the radiant glows of the sunset are glimpsed through the harsh aesthetics of telegraph pylons. This matching of nature and the manmade world is not just a visual element, one of striking, almost unworldly, beauty, but a crucial theme of the story. 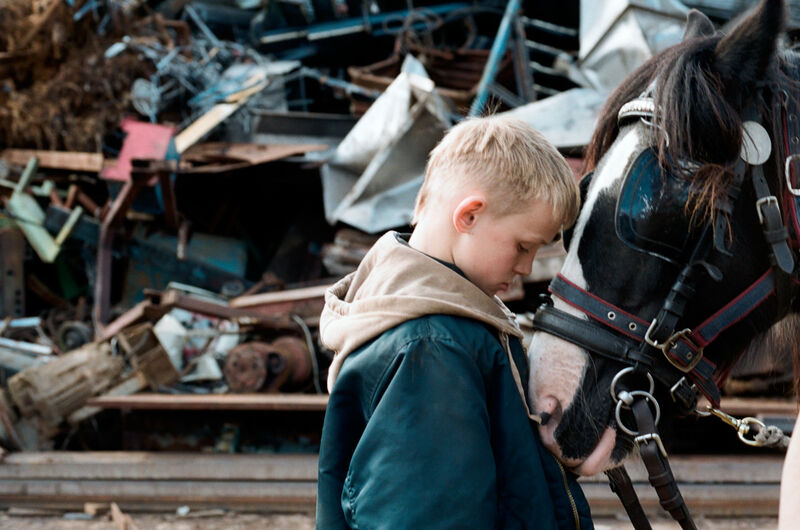 The boys’ encounters with stallion Diesel act as an opening into the innocent natural world, a place virtually absent from the depraved apocalyptic dreariness of reality, the phrase “grim up North” has rarely been so apt. ­The gloomy, down trodden streets of the North are a familiar landscape to most through their countless reincarnations, in TV with Southcliffe and Red Riding as well as on the big screen countless times, Tyrannosaur or Dead Man’s Shoes just two examples. In fact The Selfish Giant has more than sprinkling of familiarity about it, there’s a niggling feeling that we’ve seen it all before, the most obvious comparison that springs to mind is Ken Loach’s Kes. In fact it’s nigh on impossible to separate Clio Barnard’s film from the tale about a hapless school boy’s friendship with a kestrel, a glimmer of hope in an otherwise hopeless world, sound familiar? The Selfish Giant feels like its trotting over a well-trodden path without adding anything notably different, shocking or profoundly moving. The marginalisation of the boys goes beyond the norm by providing them novel backgrounds, Arbor’s ADHD and Swity’s gypsy family, but this is little more than contextual detail left unexplored for the most part. Kitten’s role as the children’s employer is double edged, leaving more than hint of Bill Sykes or the child catcher in his probable ulterior motives. The underlying fable-like, maybe even tragic, story is simple and executed accordingly, not to say there is a need for ridiculous melodrama or outrageous action sequences but the simplicity falls on the wrong side of the picket fence into a dull, tedious splatter. The tale unfolds at a time bending slowness, the dialogue is limited, often ineligible, and little actually happens making the audience relieve a guilty sigh of relief come the sudden end credits. If we are to call this outstanding cinema then surely the successful formula is to make a sluggish story of meaningless dialogue that is rooted in the gritty North. 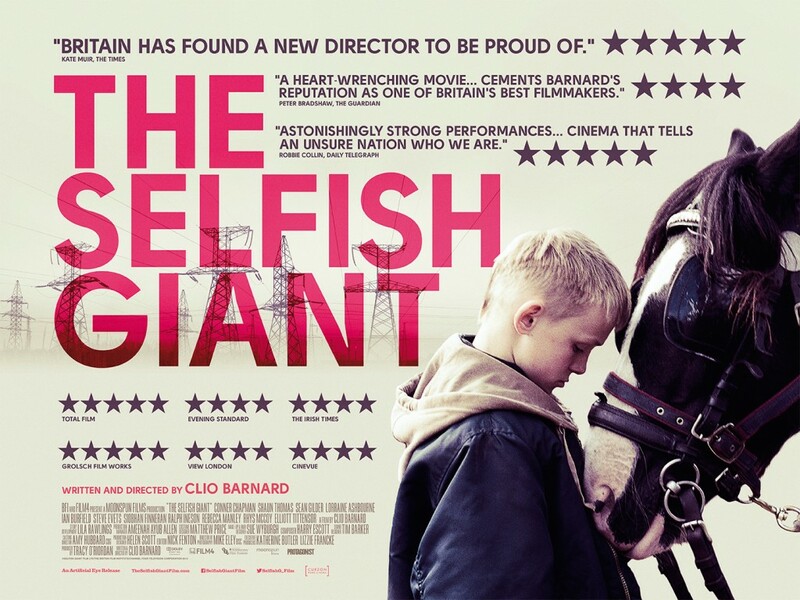 The Selfish Giant resembles a short film, superb in its cinematic execution but lacking the heart despite its honest portrayal of English poverty. The two young leads will undoubtedly gather masses of plaudits but honestly what do we critics expect of a nationwide release, amateur dramatics from a randomly selected youngster off the streets? Yes Chapman and Thomas are good, taking their adopted characters on with authority, but they are professional actors in a burgeoning career, to shower them with unrivalled praise is nothing sort of patronising. One of last year’s Oscars’ biggest surprises was the heart-warming brilliance of Beasts of the Southern Wild and its youngest ever Best Actress academy nominee Quvenzhané Wallis. The film was a breath of fresh air amongst the usual suspects- honest, gripping, gorgeous in its savage Louisiana bayou setting and anchored by a wonderfully natural father-daughter relationship, distinctive in every way. The Selfish Giant echoes Southern Wild’s youthful focus living in unbelievable marginalised society but lacks any of the warmth, hope or magic of the latter. Barnard’s film holds much promise but lacks emotional depth, failing to grip the viewer’s sentiments in order to work it in to a soppy mess at the tragic tale ahead of them. I more than anyone hate films branded as ‘feel good’ but The Selfish Giant goes so far the other way its void of interest, the fact the story deviates minimally from a familiar plot arc involving poor young kids, something we have seen enough to desensitise us beyond the film’s simplicity. If this the best British cinema can produce and the spear head of a new new wave then there is no need to fear the British coming. Clio Barnard is young, talented director and The Selfish Giant will be a stepping stone to greater things, the foundations are in place for something truly outstanding and memorable from her, just not yet.